HILO, Hawaii — The first time you fly into the Kona Coast on Hawaii’s Big Island, you’ll be struck by two things: the nearly relentless sunshine (moderated by volcanic smoke that locals call “vog”) and the vast, barren fields of black lava rock stretching northward, more testimony to this island’s active volcanoes. The first time you cross the island to the town of Hilo, you’ll likely notice two different things: (A) It rains. A lot. (B) It’s very green. 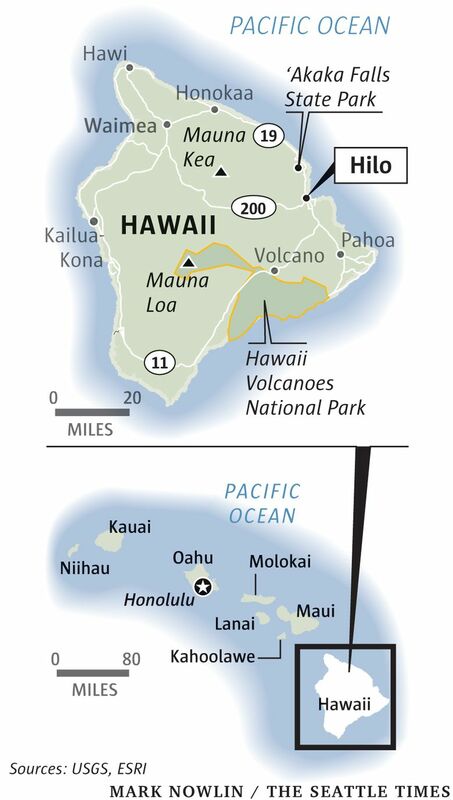 Two massive volcanic peaks, Mauna Loa and Mauna Kea, split this island and serve to “catch” the weather systems that ride on trade winds from the east. That means the Hilo side gets the rain — and it also means the Hilo side gets something pretty special in Hawaii: waterfalls. When the tropical sun comes out after a cleansing rain, Hawaiian waterfalls create rainbows. They spread life-giving moisture in their rocky canyons and nurture dainty wild orchids and dripping rock gardens of mosses and ferns. They churn clouds of cooling mist, calming as you lift your face to catch it. With that kind of soul nourishment, who needs a bowl of poke? And, if you find the right spot, you can swim or kayak at a waterfall’s base without the rapid-onset hypothermia you’d risk in a mountain stream near Seattle. We even found one where guests of a small resort routinely rappel down the waterfall’s face. 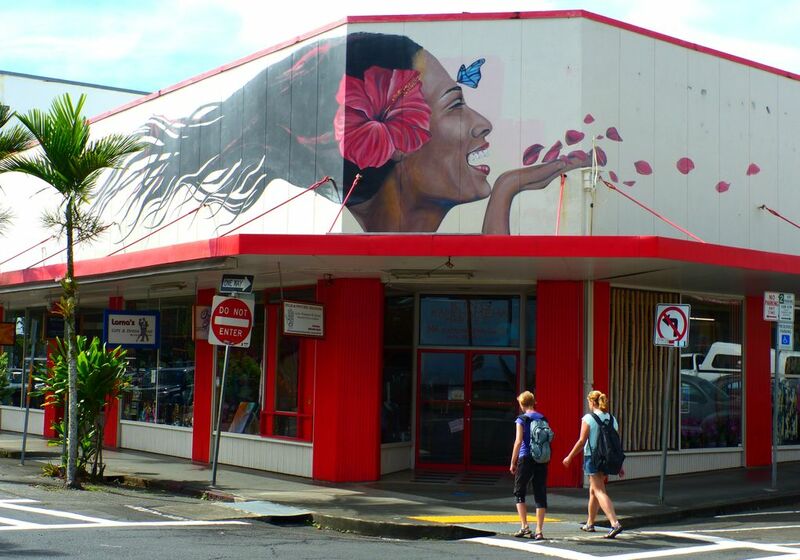 Hilo itself is worth a visit, to appreciate the historic character and lazy pace of a real Hawaiian town, population about 44,000, that’s not smack in the middle of the tourist track (if you pick a day when cruise ships aren’t visiting). 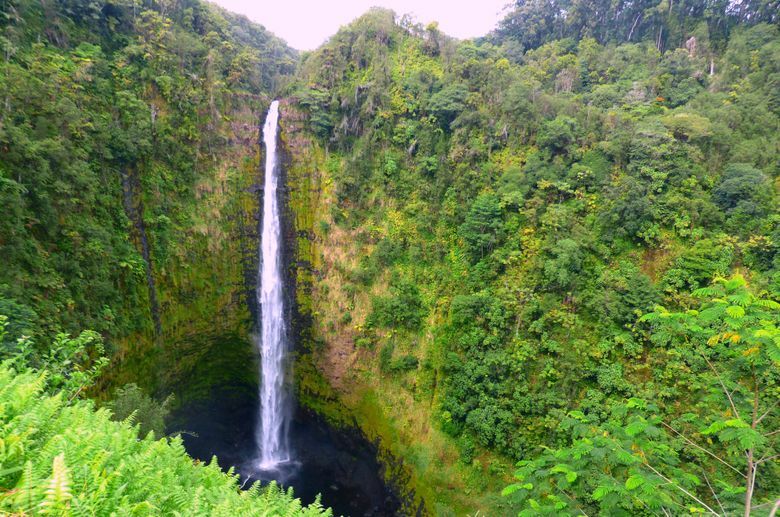 There are several easily accessed waterfalls around Hilo and along the Hamakua Coast to the north, including gushing Rainbow Falls, minutes from downtown on the Wailuku River, and `Akaka Falls, one of the most stunning waterfalls in all of Hawaii, in a state park about 11 miles north of town. 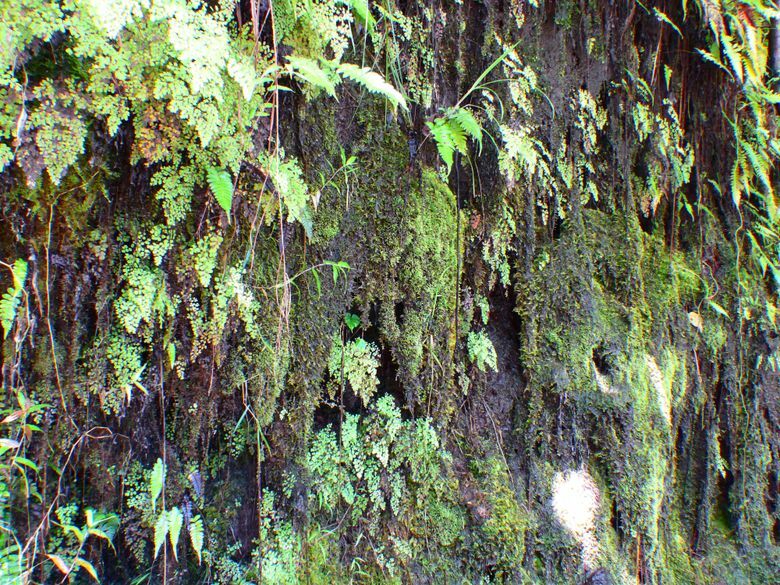 `Akaka is where Kolekole Stream plummets 442 feet down a mossy cliff into a deep bowl ringed by lush greenery. In Hawaiian, `Akaka means “a rent or split,” and the falls and its gorge indeed rend the junglelike landscape. To reach a viewpoint, follow a paved, .4-mile loop path (with stairs; not wheelchair accessible) lined with tropical plants and flowers from across the Pacific. 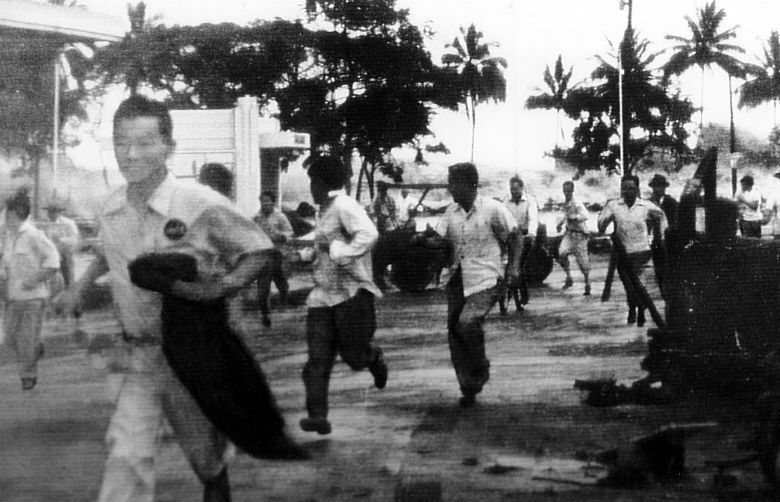 Hilo's Tsunami Museum offers dire lessons about killer waves. Get to `Akaka Falls between 9 and 11 a.m. (it opens at 8:30, $5 per car for nonresidents) to beat tourist-bus crowds and get the best photos, with sunlight all the way to the falls’ base. 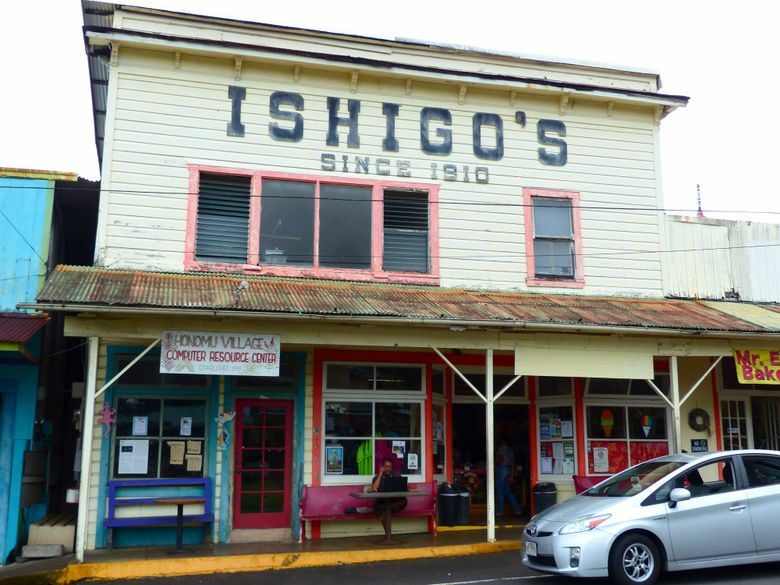 Skip breakfast at your Hilo hotel, follow Highway 19 (Hawaii Belt Road) north to the `Akaka Falls turnoff, and stop down the hill from the falls in the sleepy, old-Hawaii sugar plantation village of Honomu for pastries at Mr. Ed’s Bakery and coffee from Hilo Shark’s Coffee. Back in Hilo, the Rainbow Falls viewpoint — part of a state park with no fee — also attracts many tourists, and its parking lot can fill. But here’s a way to get an up-close look from a private viewing deck on the opposite side of the river: Book a waterfall tour with Hawaii Forest & Trail guide service, as we did. We met Hilo-born tour guide Frank Loney, a 68-year-old retired horse trainer, at Hawaii Forest & Trail’s new downtown Hilo office and were soon on our way with another couple in an air-conditioned van. The upside to this tour was that we didn’t stop where other tour buses go. Hilo is the right place for a waterfall tour, Loney told us. “You find waterfalls in rain forests,” he said. And with 127 inches of rain in an average year, “Hilo is the wettest city in America.” The island’s wettest point is about 6 miles upslope from Hilo, where the mean annual rainfall exceeds 300 inches, according to the National Weather Service. And it’s not like Seattle, the drizzle capital of America (which averages only 37.5 inches of rain per year, but spreads it out over more days). The night before our October tour, rain gushed like a fire hose on the roof of our rental cabin south of town. So every waterfall we visited was roaring. First stop was where a narrow, old, lightly-trafficked bridge crossed directly over a waterfall on the Honoli`i River. Loney shared much about the island’s natural history. Along the way to Rainbow Falls he pointed out breadfruit trees and kukui, or candlenut trees, the state tree of Hawaii. Our destination was OK Farms, a sprawling spread growing bananas, macadamia nuts, coffee, citrus fruits and more. Down a narrow track was the river and a covered platform where we stopped to look over the top of 80-foot-high, 100-foot-wide Rainbow Falls. All to ourselves. Bumping along an old sugar road, we stopped at our next falls, on Waiau Stream: Ka`imu`kanaka Falls, with low twin flows and a deeply carved cave near the base. Here was another covered viewing platform, where we took time out to sample some local specialties: freshly cracked macadamia nuts, plus longan fruit, related to lychee. Our final waterfall was Kulaniapia, situated on a private resort of the same name, also on Waiau Stream. We munched sandwiches on a balcony overlooking the waterfall before wandering down a grassy path lined by tiny magenta orchids and big stands of bamboo. 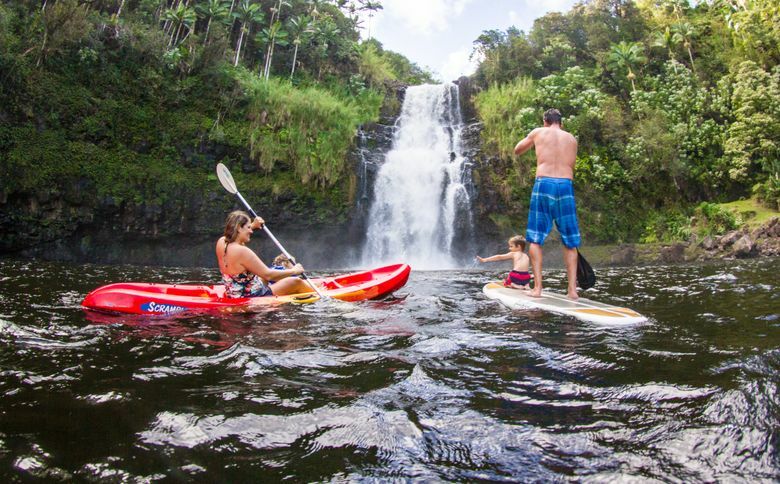 This is usually a safer stream than the Wailuku River, and at the base of the waterfall on quieter days, tour-goers can swim, kayak or go stand-up paddleboarding beneath the spray. Resort guests regularly rappel down the 120-foot waterfall. This day, we waded while taking in the spectacle of the rain-gorged torrent. On our own the next day, my wife and I drove up the Wailuku’s south side to a viewpoint called Boiling Pots, named for the bowllike pools below Pe`epe`e Falls, just upstream. Our hotel manager had advised that it was possible to hike down from the viewpoint to swim near the falls. 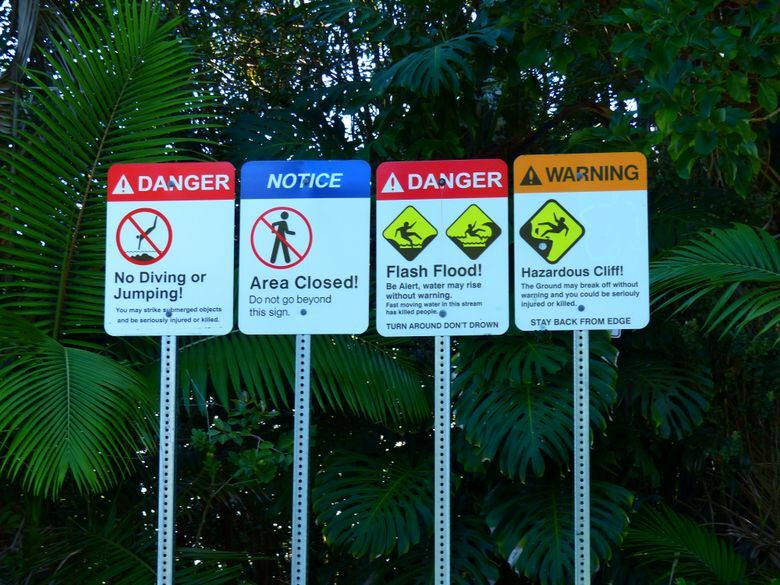 But new barricades blocked the path, with four brightly colored signs prohibiting diving or jumping, and warning of possible flash floods (“Turn around, don’t drown”) and a hazardous cliff (“The ground may break off without warning and you could be seriously injured or killed”). We decided to take their word for it. However, I wanted to see a wild waterfall on my own, so from Boiling Pots we continued up Waianuenue Avenue for .6 of a mile to find Wai`ale Falls. After crossing a bridge, we parked on the shoulder and spied a narrow path just beyond the bridge on the upriver side of the road. 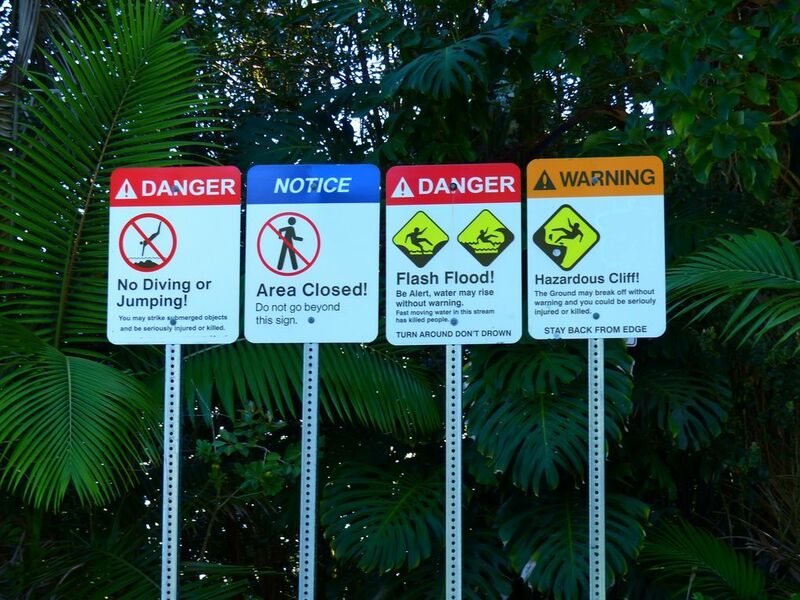 Here, another sign warned of flash flooding during rainstorms. But the sky was blue. My wife waited in the car while I took a 15-minute clamber — not for the faint of heart — along a narrow, muddy trail through thick brush and trees to reach an overlook atop the upper tier of Wai`ale Falls. Here were more orchids and other wildflowers, shallow pools for soaking feet, and another small, hidden waterfall I wouldn’t have seen if I hadn’t made the hike. I sat on a rock, basked in the sun and listened to the roar of my own private waterfall for five minutes. Then it was time to head back to town. My soul was, indeed, nourished. But it was still time for lunch. 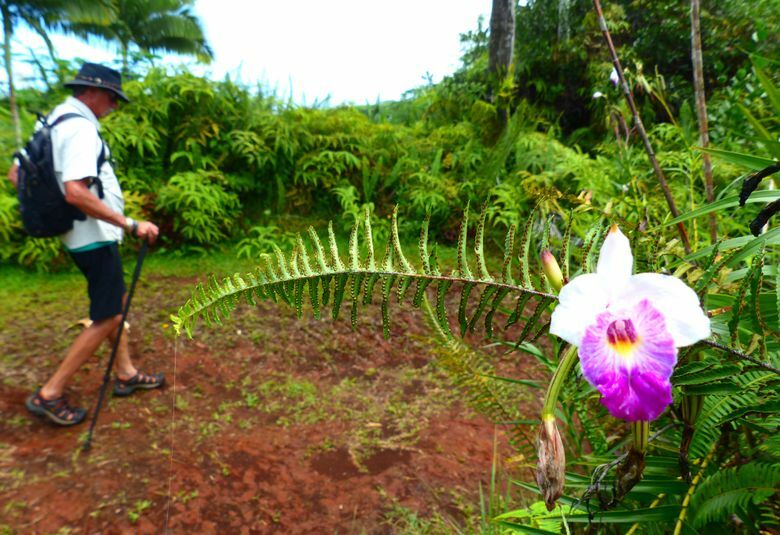 The 3 ½-hour Hilo Tropical Waterfalls Tour with Hawaii Forest & Trail guide service is $118-$142, including lunch: hawaii-forest.com. 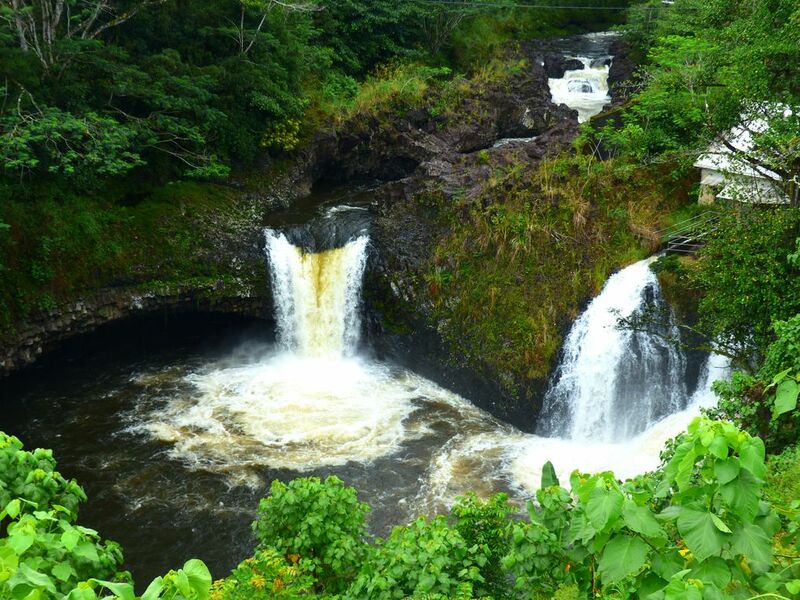 • For an up-close waterfall experience, book a room or guesthouse at Hilo’s Kulaniapia resort, which has its own private 120-foot waterfall. 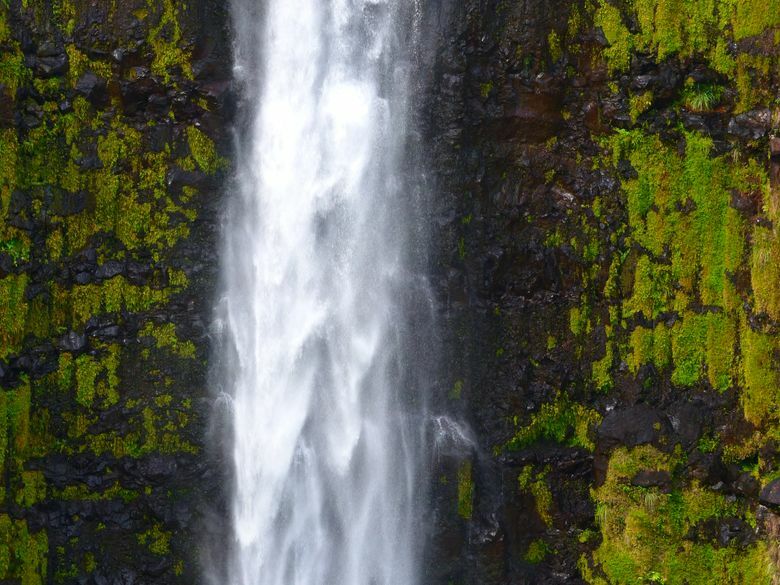 Hire a resort guide to help you rappel down its face; waterfall.net. 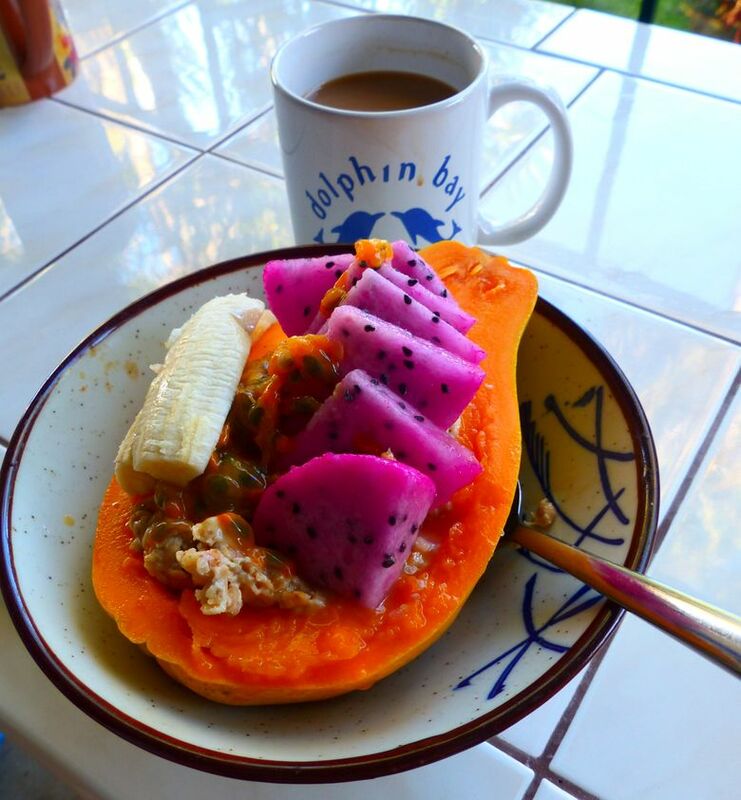 • Hilo’s cozy, old-school Dolphin Bay Hotel, in a neighborhood a short walk from downtown, invites guests to help themselves to free tropical fruits, coffee and breakfast breads; dolphinbayhotel.com. 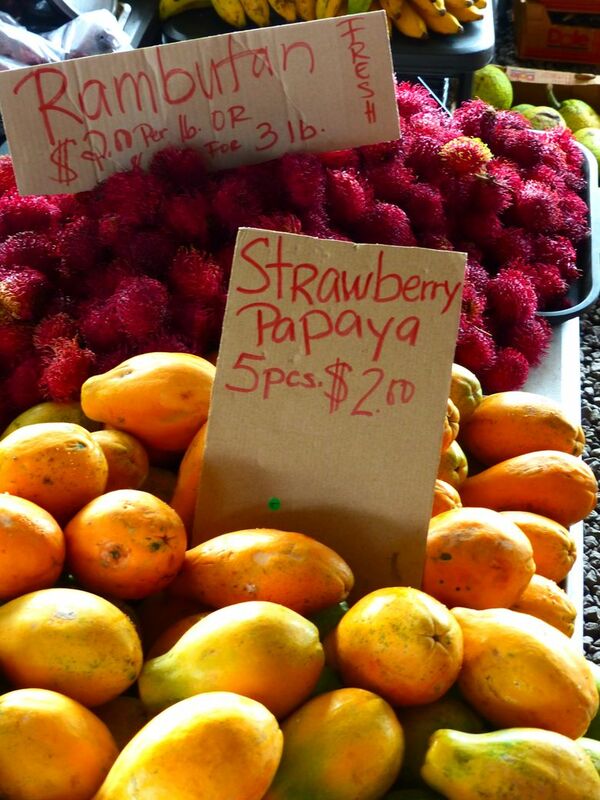 For a quieter time, visit Hilo on a day without cruise ships in port. Check crew-center.com/hilo-hawaii-cruise-ship-schedule-2018.